A vacation custom designed for you! SEA for yourself as you open the sliding glass doors to your beachfront patio! SEA for yourself as you behold the stunning vista of St. John and the British Virgin Islands! SEA for yourself the crystal clear water lapping up on the white sand in front of your suite as you enjoy the cooling trade winds! SEA yourself only feet away from the water on the ground floor of coveted 'E' building at Sapphire Beach Resort and Marina! Enjoy all the advantages of peace and quiet, located within the resort yet away from the activity on the main beach! This luxurious ground floor suite located at Sapphire Beach Resort and Marina is on one of the most breathtaking beaches in the Caribbean. Step off your beachfront patio onto the sugar soft sand only feet from water's edge. Feel the tropical sun on your face and let the trade winds keep you cool as you take in the stunning panoramic view at your home away from home in a tropical paradise. Get away from it all in our fully renovated, elegantly furnished, centrally air-conditioned condo. Located on the eastern tip of St. Thomas, your view of Pillsbury sound ringed by exotic islands (Congo, Lovongo, Thatch Cay, St. John and Tortola) will be a constant reminder that your vacation is nothing short of spectacular! Your immaculate, impeccably maintained suite comes fully equipped: renovated custom kitchen with stainless steel appliances and matching desk with marble top; custom furniture and cabinetry; luxurious modern tiled bathroom with travertine double vanity and spacious glass enclosed stall shower; premium towels and fluffy bathrobes; king size pillow top mattress with luxury linens; flat screen television sets in living room and bedroom; Tropitone patio furniture; other upgraded fixtures and finishes throughout; free wi-fi; snorkeling gear in closet for unlimited use during stay; beach towels, lounge chairs and snorkeling gear provided; daily towel change and trash pickup included. Our on-site property manager/concierge will greet you, answer all your questions and help create a vacation tailor-made especially for you. Take advantage of all the island has to offer or just relax on your beachfront patio only feet from the water while enjoying the spectacular view. Wake up early and watch the sun rise as you enjoy your morning coffee on the beachfront patio. Soak up the sun on one of the best beaches on the island or beach hop for a bit of local color. Snorkel from the beach in front of your patio. Enjoy a day cruise or fishing trip departing from the on-site full service marina featuring a complete array of water sports. Hop a ferry in nearby Red Hook and explore St. John or one of the British Virgin Islands. Play a round of golf at nearby Mahogany Run. Shop ‘til you drop downtown in one of the largest duty free ports in the Caribbean and take advantage of the increased duty free allowance in the US Virgin Islands. And when the day is done, enjoy a drink on your patio admiring the view and then dinner at one of the island’s many casual or premier restaurants. No matter what your wish, doing anything, doing everything, or doing nothing at all, this is the place for you!! We live in NYC and are lucky to have our own a piece of paradise on beautiful Sapphire Beach in St. Thomas! 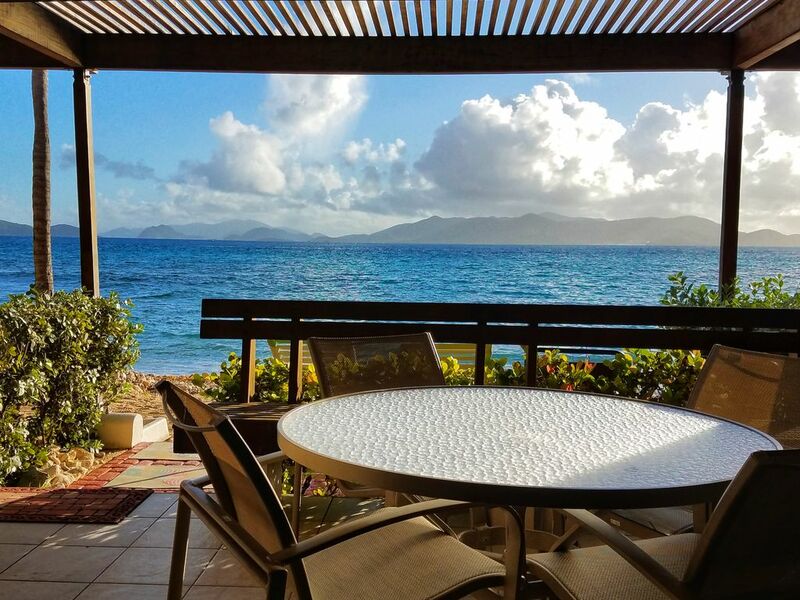 Sitting on our patio gazing out at the amazing view of St. John and the British Virgin Islands is the perfect counterpoint to life in the busy city. Since we are only a 3 ½ hour non-stop flight away, we try to visit as often as possible and have equipped our condo as a second home with everything you might possibly need during your stay. We look forward to welcoming you as our guests and will do everything we can to help make your vacation Picture Perfect! LOCATION, LOCATION, LOCATION!!! Sapphire Beach is one of the most beautiful beaches on the island with some of the best views. We have a beachfront pool and a marina with boats taking day trips to St. John and the British Virgin Islands, fishing charters, jet skis and parasailing; and a beach hut to rent kayaks and SUP's. There's a beach bar and grill on the property and a restaurant in the neighboring condo complex within walking distance so you can do as much, or as little, as you like without going far. Our condo is located on a smaller, more private beach adjacent to the main one on the property which is only a one minute walk away. Our building is only 20 feet from the water and has the best views on the property. Since we are so close to the water, you can hang out on the patio in the shade or directly in front of the condo in the sun and have easy access for a cool drink or to freshen up. The only people on "our" beach are those staying in our building so you may even have the whole beach to yourself at times! Rate includes fresh towels daily. Beach towels provided. Step off beachfront patio onto the sand; 20 feet from the water; Like having your own private beach !! Great condo with a beautiful view! My husband and I had a wonderful time visiting St. Thomas! Unit E-103 at the Sapphire Beach Resort is clean, well-maintained and spacious. When we booked the condo, the owner responded with a warm welcome providing many helpful websites about activities in the area, restaurant & taxi suggestions, and general useful information to have ahead of time. A local contact's name & number was provided if we should have any issues or questions. An extra perk with this condo was having clean towels provided each day and your garbage picked up. Building E is farther away from the public beach so it is a quieter building. We enjoyed being in a ground level condo with a beach-type area in front of the patio and easy access to Sapphire Beach and the Marina. You do have people walking by when you are on the ground level which is a slight disadvantage but being in Building E you have less public traffic. Watching the sun rise each morning while eating breakfast on the patio area was wonderful. There is a breakfast bar on Sapphire Beach which is handy and the restaurant Slice at Sapphire Village has good food. Red Hook is a brief taxi ride away and has a grocery store and several good restaurants. Charlotte Amalie is a short taxi ride away and has fun shops and a flea market to visit. The ferry to St. John is in Red Hook and is about a 20-minute ride across the bay. Sapphire Beach is a nice public beach but shade is at a premium. We set up our beach chairs early in a shady spot under one of the palm trees to avoid being in the baking sun later in the day. There is a schedule of when the cruise ships are docking so you know when the beach will be busier and can plan accordingly. Overall we had a wonderful time and would love to go back. I would definitely recommend the Sapphire Beach Resort and this condo. Imagine you are steps away from a beautiful blue bay with sunny skies with cotton puff clouds. Then come here. You got it. So many places look like they are geared for renting out. Here feels like the owners live here. They do! For us it was like we had been invited to stay at a friends house. Walking in the door was like being home(if you lived in paradise :) ). Everything is clean, well taken care. Laid out well. There is a dining table and chairs. We ate outside every meal that we were there for. The sound of the light surf with a gentle breeze was great. When we left, we started talking, when can we come back? We had a wonderful time staying and Annette's condo! Even though we had previously been to St. Thomas Annette provided detailed information around activities to do and places to visit. The condo has everything that you need, full kitchen, updated bathroom, shaded patio, lounge chairs, steps from the beach, and a partitioned you can pull out if you like to get up early and others want to sleep in. The pool bar has very good hamburgers and for dinners we would either go to Red Hook, St. John’s, or going up the hill to a restaurant called Slice. The pool is very nice, relaxing, and the Sapphire Beach is awesome! We would stay there again! We loved staying here, the views were amazing and we found ourselves out on the lanai pretty often. Because the property faces east you are out of the sun most of the day which was very nice. The only negative I can really give on this is the state of the condo complex. The pool area was barren and in disarray, the restaurant has not re-opened but there is a beach bar a little further away that had amazing fish tacos. Red hook is pretty close, so we found ourselves going into town at night for dinners, although on the hill nearby there is a restaurant called Slice that had pretty good food and live entertainment. Everything was perfect, and Annette was amazing and responsive. Highly recommend staying here if you’re looking for great views, access to Red Hook, and a place that’s just steps to the water. The property had everything we needed, and Sapphire Beach, which was just a two minute walk, was beautiful (had a great bar too!). Lastly, even though you’re in a condo complex, the location of this property was snuggled in next to a quiet marina and felt relaxing and private. We look forward to staying here again in the future. The condo has the greatest veiw you could ask for and the full moon makes it even better. The condo itself is stocked with everything you need from the kitchen gear to the snorkling gear. The Carribean Sea is right outside the sliding glass doors. Red Hook is a short distance with restaurants and shopping and the ferry to St. Johns Island (a must do) Annette will give you all the information you need for your stay.